And that means FEATURE time. Every Friday (or almost every Friday), we try to feature a vegan product, brand, mission, ecttt that we think will bring some value to your life! 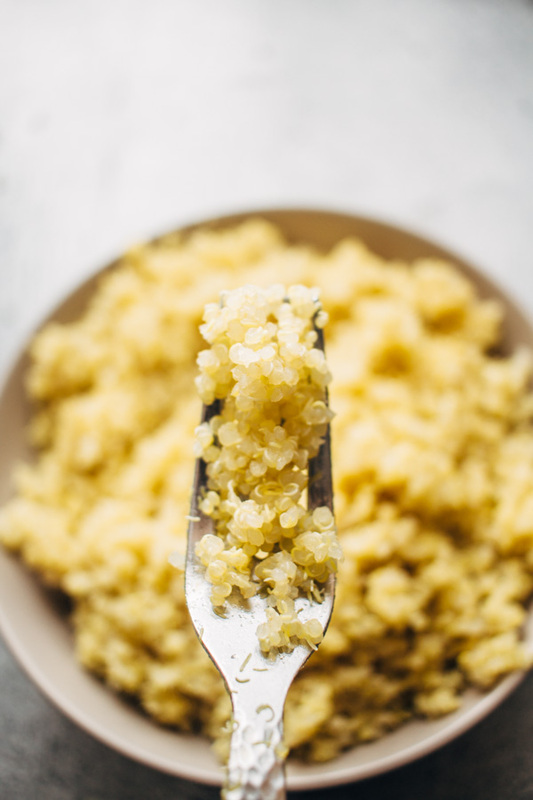 Today we're talking all about QUINOA - what it is, what are the benefits of eating this, and most importantly, how to cook it... because it can be tricky! 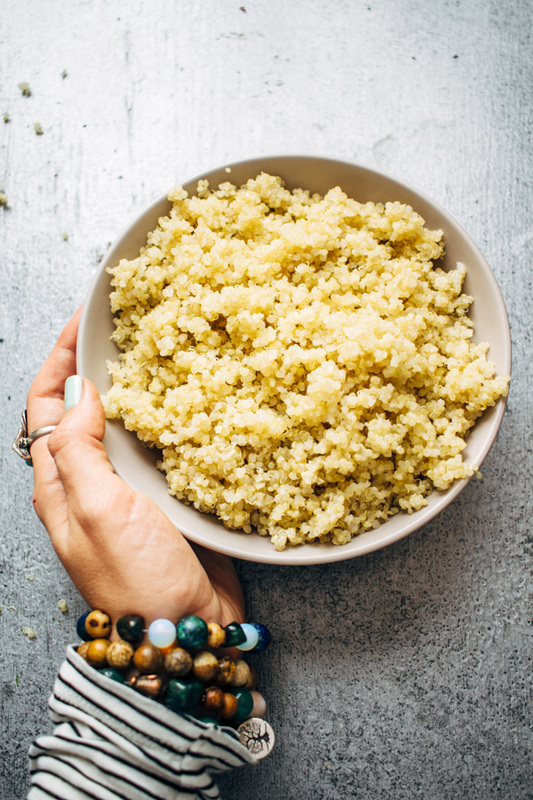 what is quinoa and why is it good for me? If you are not familiar with what quinoa is already, let me fill you in. Anyway, the point is - since it's not reallyyy a grain... it's gluten free, and a great alternative for those who are A. gluten intolerant, and/or B. have a sensitivity to grains or simply want to avoid grains all together. 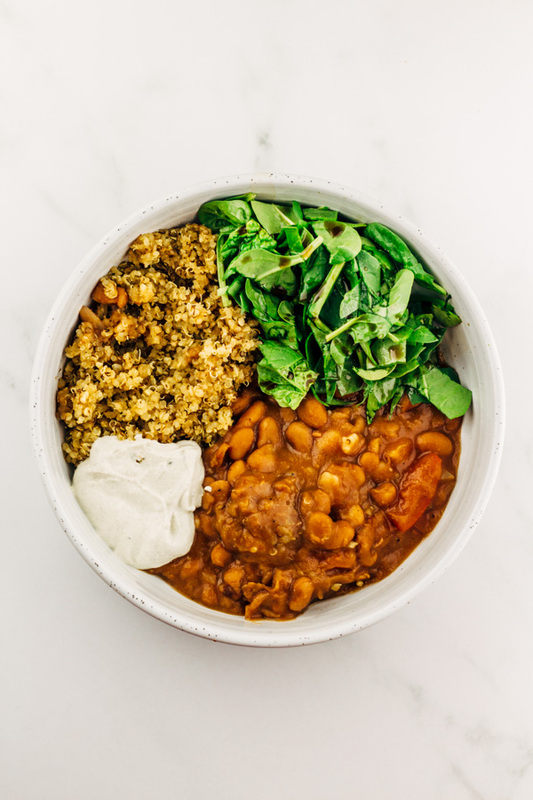 Quinoa is also highly nutritious and it's no surprise that it has become a popular superfood in the last few years with this new wave of wellness consciousness. 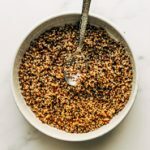 It has a ton of fiber which helps us stay regular, and it's a great source of protein (around 24 grams of protein per 1 uncooked cup) .. so, next time someone asks you 'where do you get your protein from' - you can say from QUINOA! 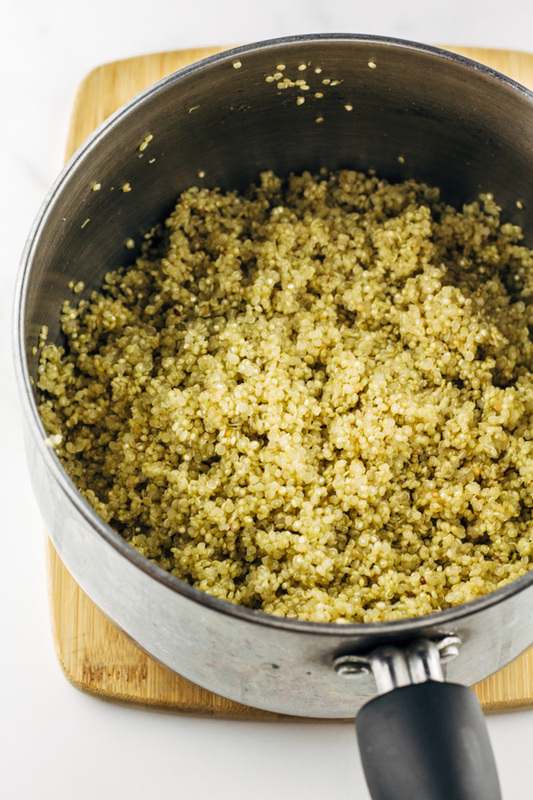 Quinoa also contains nine essential amino acids - but what does that even mean right? You might have heard this saying before: Amino Acids are the building blocks of life. Our cells, muscles and tissues are made up of amino acids. They help our cells, muscles and tissues do all sorts of stuff like transport and store nutrients, repair damaged tissue, and assist in many other bodily functions. We can all agree that amino acids are prettyyy important right? Okay, so here's the thing... there are nine ESSENTIAL amino acids, essential meaning that we absolutely need them in our body, yet the body doesn't produce them naturally... so we must get them from our food. And that's where quinoa shines - because it contains ALL nine essential amino acids! SCORE! I like to treat quinoa as if it was rice. I usually include it in dishes as an alternative to rice. You can serve it with beans. It goes great with vegan garbanzos or red kidney beans. 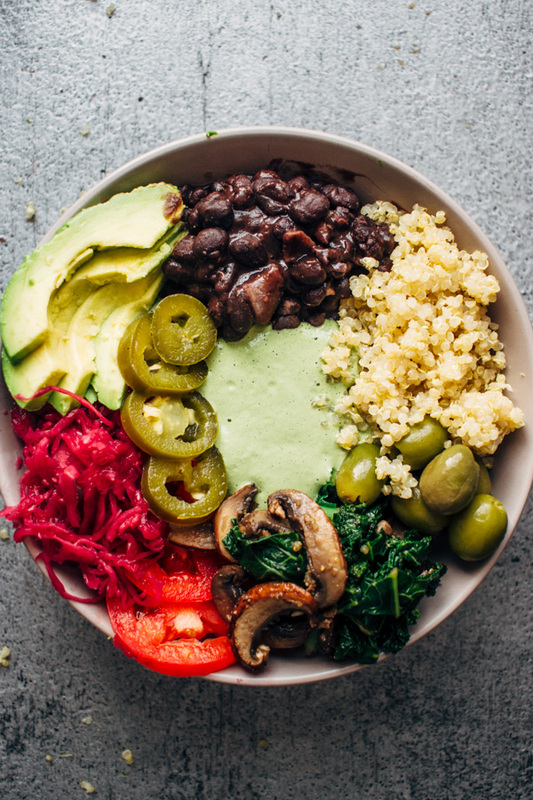 You can make a 'bliss' bowl using quinoa.. you can stuff your vegan sushi with quinoa.. you can add quinoa to your favorite soup for a heartier and more filling meal. Lotssss of options with this little magical not-a-grain-but-a-seed food. Quinoa may seem a bit tricky at first and straight up intimidating. When I first bought quinoa I think I kept the bag in my pantry for weeks before I finally decided to face my fears and cook some up. Bring to a boil, then lower the heat, cover and let simmer until all the water has evaporated and you are left with a fluffy and light quinoa. Here's the deal - many quinoa recipes call for a 1 to 2 ratio, meaning 1 cup of quinoa and 2 cups of liquid. You can definitely do it that way, but based on my experience (and my preference) I like the texture of quinoa cooked with only 1.25 cup of liquid. It's drier, fluffier, and less 'mushy' and wet. 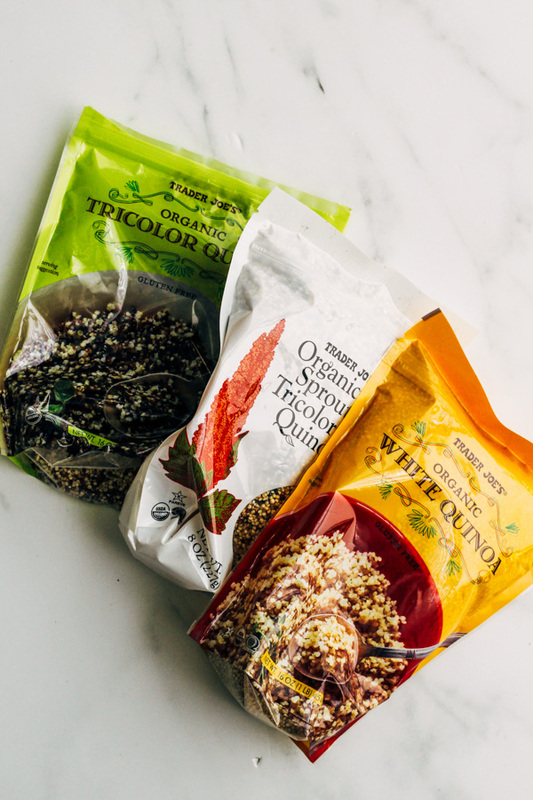 The most common type of quinoa is white, and it may be the one you are familiar with already but did you know there is also red and black quinoa?! And then there is also the 'sprouted' kind which means that the seeds have been soaked and allowed to 'sprout' or grow, become alive. It is believed that anything that has been allowed to sprout has more nutrition and contains more energy than 'not sprouted'. Today it is very easy to find quinoa in your nearest grocery store due to it's popularity. You can definitely find some in your nearest Whole Foods or Trader Joe's store. I have only seen the sprouted kind in Trader Joe's (pictured above). You can even find a variety of brands and types of quinoa on amazon! Are you a quinoa fan? What's your favorite way to eat it? Share with me below. Want to see more Friday Features? Find out What Is The Best Store Bought Vegan Ice Cream Brand or Learn Why Frozen Fruits Are A Must Have For Vegans. 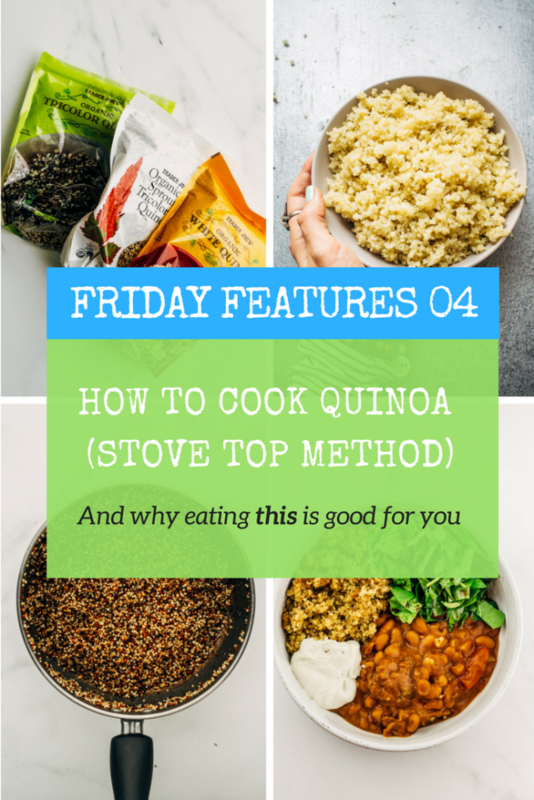 An easy and fool proof way to cook quinoa on the stove top. Add 1 cup of quinoa, 1 1/4 cup of vegetable broth or water and a dash of salt to a pot and bring to a boil on the stove-top. 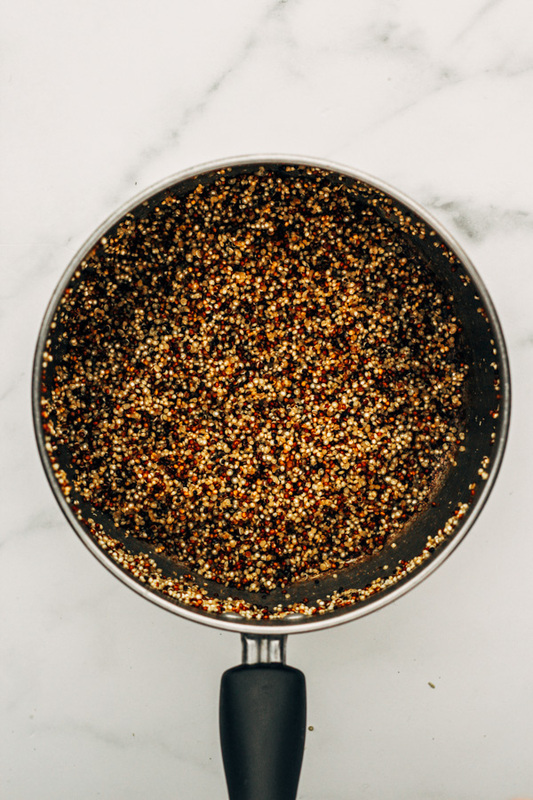 Once it begins to boil, bring down heat to low/medium, cover and let simmer for another 10 to 12 minutes or until all water has evaporated and quinoa is soft and fluffy. Quinoa recipes usually call for 2 cups of liquid, but based on my experience I have found that using a 1:1.25 ratio really leaves you with the driest and ‘fluffiest’ quinoa, vs a mushy and wet quinoa. Feel free to experiment, and if your quinoa still seems uncooked feel free to add a bit more water or veggie broth.